People witnessing a woman fall through the ice in Edwards rushed to her aid. One called 911 while two others accessed the throw bag stores in a rescue station provided by Eagle County a couple of years ago. 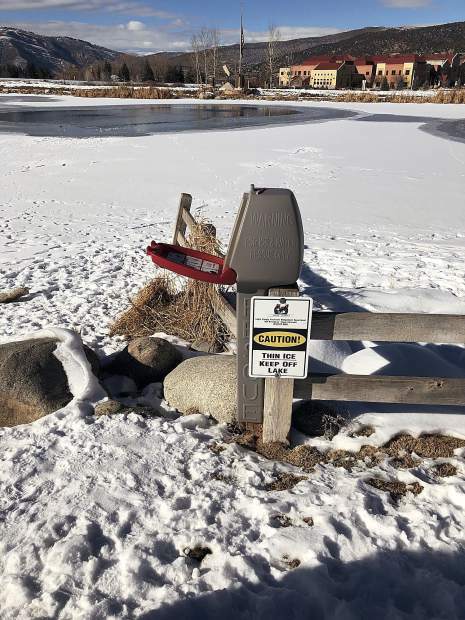 EDWARDS — At approximately 12:45 p.m. on Tuesday, Eagle River Fire Protection District crews responded to a report of a woman and a dog that had fallen through the ice at Freedom Park in Edwards. Bystanders reported that the dog fell in first, and the woman subsequently fell in while attempting to rescue the dog, a practice that ERFPD strongly discourages. The event was witnessed by several people, and one called 911 while two others accessed the throw bag stored in the rescue station provided by Eagle County a couple of years ago. The rescue throw bag is designed for shore-based rescue and provides the ability to safely pull a victim to shore without placing rescuers in danger of falling through the ice as well. They were able to extricate the woman, who was evaluated and warmed up by paramedics on scene. The dog was able to self-rescue. Pet owners are reminded that dogs lack awareness when it comes to ice conditions. When walking on or near ice, keep your pets on a leash. If a pet falls through the ice, do not attempt a rescue yourself; call 911 immediately. Well-meaning pet owners can too easily become rescue victims themselves when trying to assist their pets. ERFPD urges parents and teachers to talk with children about ice safety. Immediately activate the 911 emergency system if a pet or a loved one falls through the ice. If you don’t know that the ice is 100 percent safe, stay on shore; would-be rescuers frequently become victims when they fall through the ice as well. Instead, throw a long object that the victim can hold on to, such as a pole, a rope, a tree limp or even a long scarf. And while it’s a natural instinct to go in after your pets, instead encourage them to swim and call 911 immediately.